and I don’t know why.. I didn’t actually knock the post over and you can’t get sued for trying …. can you?. And I am pretty and pleasant with a nice voice – unlike my cousin Venice (the menace), who hurts your ear drums when she wants her mom. So why did I get sued? Shepherd doesn’t know either, but she’s the one with fingers, so she can finish the post. SUED stands for Split Upper Eyelid Deformity. 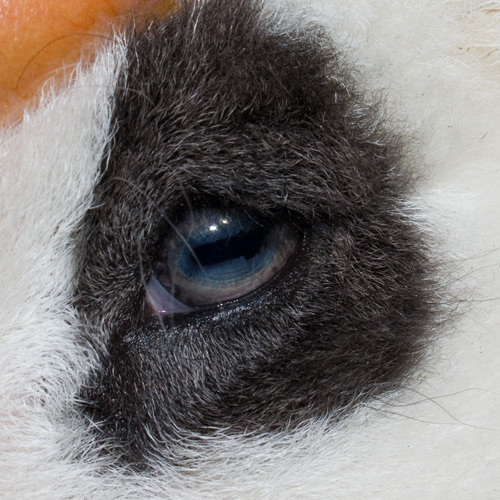 The split eyelid is related to the polycerate (multi-horn) gene. 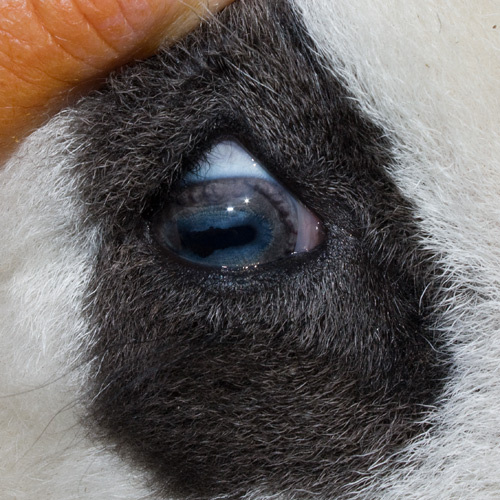 The split in the embryonic horn bud continues into the eye socket. The first indication that Banner might have SUED was this tiny tuft, located about an inch above his eye. This is more apparent being a white tuft that falls over a lilac eye patch. reveals the notch (or split) (pardon the iodine orange finger – new babies this morning). The normal eye..
Wow – does that boy have gorgeous blue eyes or what!! Should an animal with SUED be used for breeding? This is an individual decision and not one I’m going to make for anyone. 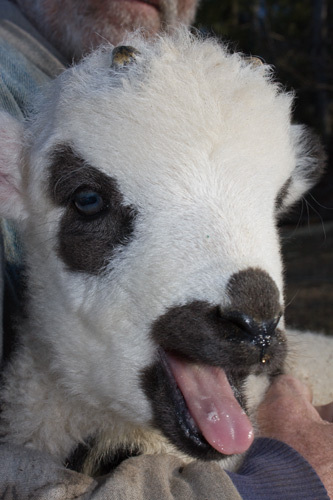 If you are not a member of the Jacob-list, I suggest going to www.jacobsheep.com and browsing the Jacob-list archives. You’ll find plenty of reading information on SUED and lots else. You’ll find plenty of opinions to get you thinking and maybe coming up with your own opinion. There are different grades of SUED. 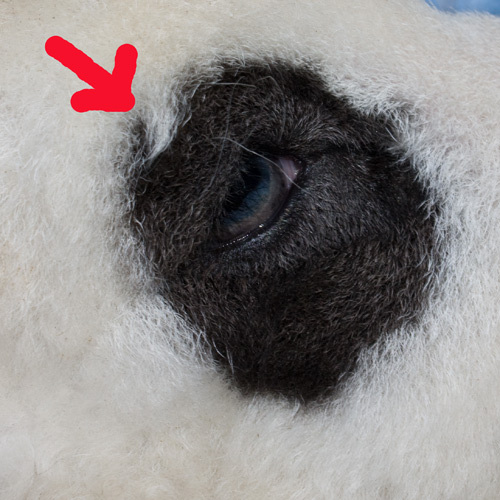 Banner’s is a mild notch, which does not cause any discomfort and is not visible without pulling his eyelid. Splits can be bad enough to cause considerable discomfort without medical attention and may require surgery or an invitation to dinner. Some breeders feel it is a random expression of the polycerate gene. In England, breeding against SUED eliminated most of the four horn Jacob population. Is SUED heritable? As far as I know, there has not been enough research to make that decision. I know of rams with SUED that have never sired SUED lambs. And rams without SUED that have sired over 50% lambs with SUED. Like Banner said, “Shepherd doesn’t know either”. 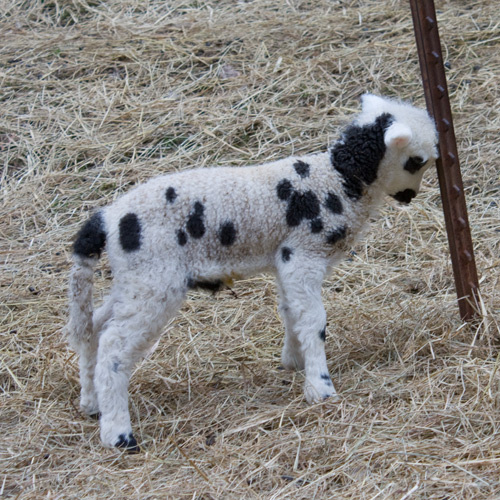 Linda- it get’s even more interesting- I just looked at another Jacob cross ewe- this one about 2m old, very healthy from birth and raised on mum (and white) – and she ALSO has SUED. This time on both eyes! Never really noticed it before but then I hadn’t looked closely at her eyes (wasn’t thinking SUED would show up). Now I’m wondering if the ram I used wasn’t crossed somewhere along the line. Oh- and the blind lamb isn’t anymore! Must have been a preemie or something. After about 2 weeks we noticed she was tracking us visually. She’s doing great now even though she is still tiny. I’ve heard of SUED in Jacob crosses, where the other parent was polled. I don’t know enough to even guess how that happens. Great post and wonderful comments. There is SO much that goes into this breed. I get a little concerned when a buyer wants a perfect 4-horn with 40% coloring, leg spots in the perfect place, perfect fleece (whatever that is, lol), and great structure. They are overlooking a lot of really nice sheep. I don’t encourage the breeding/keeping of AC ewes, but I LOVE the lambs that our AC ewe, Lulu, gave us this year. I love your creative approach to this post! Thanks for the great info, too. 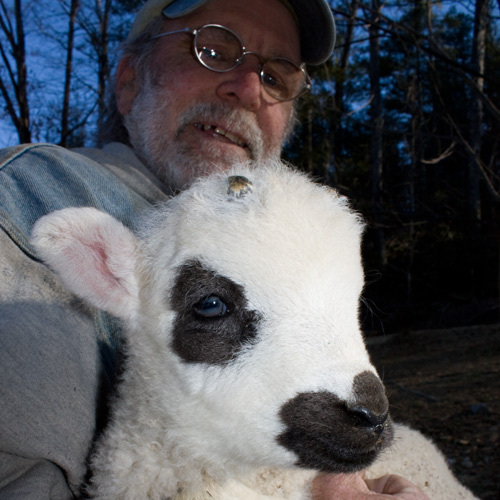 I had a ewe given to me more than a decade ago who was destined to be culled ( killed ) because she definitely was SUED. Ruth was one of my favorite ewes and because I fell in love with that ugly little ewe with pop out eyes who would have been hidden away or culled by most Jacob Sheep owners / breeders I have been blessed. Ruth’s children and grandchildren will remain here because they possess all of the many and very different qualities I desire and love about Jacob sheep. Ruth was tiny, amazingly tiny, and I have some of her great-grandchildren ( one now registered as ‘Cedar Pond’s Ruth’)who are also tiny. Yet , they have wonderful fleeces and more importantly to me. they have traits very similar to those described in many documents regarding “leader-sheep”. My first instinct was to hide these sheep, yet I have become a defender of theirs because I have observed and known them. They are by no means commercially viable for fleece or meat, or even show winners, yet they are survivors and flock care-takers and protectors. Sheep like this may well be the salvation of sheep for such as myself and others come hard times. Sorry to leave such a long comment, but I think not all undesirable traits are as undesirable as books and standards would have us believe, and sometimes non-conformity adds to the enrichment of a breed. Thank you for your lengthy post. You brought up great points and I appreciate you sharing with me. I tend to think that traits like mild SUED that are not damaging, that you have to really look hard to even see, that we do not know are heritable (none of us have enough of a database in our flocks to make assumptions on this) are of minor importance. That is not saying that I will sell or recommend a ram with SUED – but I may keep or buy one. And I will not cull a good ewe for SUED. I’d rather use a good sheep with SUED for breeding than a bad sheep without. You got to look at the whole picture. Don’t throw out the baby with bathwater 🙂 Course, I’m more of a whole picture breeder than a breeder that focuses on any one trait. Yes, Banner has very lovely eyes. Your pictures on SUED are great and show the notch along with the tuft very clearly, good job. I had a ram several years ago with a mild case in both eyes and he passed it on to two of his ram lambs and after getting in another ram haven’t had a case of it since.